Interim Chancellor Larry Sparks said achieving student representation on the state college board would be a difficult feat to accomplish because of the fact that the board’s makeup is determined by the Mississippi State Constitution. “I think it would require a constitutional amendment to get that changed, and to be honest with you, there are certain things our board delves into that, I think, with student representation, I think you might see it as a waste of time,” Sparks said in an address to the Associated Student Body Senate on Tuesday night. Sparks, along with Provost Noel Wilkin and Erica McKinley, the university’s chief legal officer, encouraged ASB officials to seek an alternate route to improve student representation in the Institutions of Higher Learning. Over the course of his ASB presidency, Elam Miller has touted his goal of improving student representation in the IHL, and he has worked to lay a similar foundation for future ASB officials to ultimately achieve his long-term goals for the campus. Miller said he and other student body presidents in Mississippi have recently established a semesterly student report to the IHL Board of Trustees. He sees this as a step closer to his ultimate goal. “We realize that it’s going to be really tough to get an actual student trustee on the board of representatives and that it would take a constitutional amendment,” Miller said. “Hopefully, we can work with Chancellor Sparks throughout his time here and set a precedent relationship that’s followed for years to come,” Abel said. 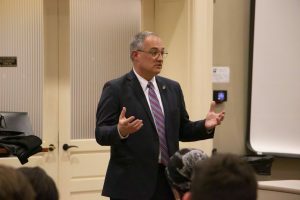 Abel said he was glad the meeting between university administration and student government came to fruition, especially after former Chancellor Jeffrey Vitter met with the ASB Senate only once throughout the past school year. “We’ll probably kick (major plans) off once a new, permanent chancellor is here, but there’s a lot of groundwork for things that needs to be happening now,” Sparks said. Several ASB senators also had questions about the purpose of the campus climate study that the university announced on Monday. The study is being carried out by the consulting firm Rankin and Associates, which is based in Pennsylvania. Sparks did not answer specific questions about the purpose of conducting the study or what what would happen as a result of the study. After emphasizing the unknown conclusions the survey could show, Sparks asked Wilkin to explain how the consulting firm would help the university with the findings. “(Rankin and Associates) can help us with the analysis and what the findings mean and what we can draw from the findings and then developing policy and developing changes that are necessary to make this a more inclusive environment,” Wilkin said.